It is our opinion that the GeForce GTX 1660 Ti has found it difficult to cement a place in the hearts of gamers because of ill-judged pricing from Nvidia. Financial considerations aside, the first non-RTX Turing card delivers delicious performance at FHD and, more often than not, keeps to a 60fps average at the more taxing QHD. UK pricing starts at £260 and runs up to well over £300, which is irritating because such sums are the preserve of the better-featured RTX 2060. This knowledge admittedly puts add-in board partners in an uncomfortable spot. They want to release feature-rich models that excel at cooling and acoustics, though doing so guarantees the price-to-performance metric goes out of whack. Still, if you do want GeForce GTX 1660 Ti, which one do you get? EVGA has a trio of cards. The cheaper duo uses a Mini-ITX form factor that we believe is ideally suited to the 120W GPU. The higher-performance model, known as XC Ultra Gaming, adopts a wider card that is also clocked higher on the core. EVGA offers you a choice. Going Mini-ITX in width pushes each card's thickness to 2.75 slots. Enabling a standard-width card - 10.5in, as is the case here - drops it to a strict two-slot design. The ability to run a better heatink also allows the XC Ultra Gaming to increase the available power from 130W (Mini-ITX) to 160W - representing a full 33 per cent over stock. This extra cooling capacity and power translates to an out-of-the-box core speed of 1,860MHz, compared to either 1,770MHz or 1,845MHz for the smaller XC Black and XC Gaming, respectively. We already know the performance uplift of the best GTX 1660 Ti versus the most basic is around three per cent in our benchmarks. We also know this cooler is capable because it's used on the RTX 2060 and RTX 2070 GPUs. Twin HDB fans, which switch off at low loads, sit directly atop of a heatsink that spans the entire width of the card. This ought to be called the Minimalist Edition because there is neither RGB lighting nor any real colour. Unlike pricier models, the corner accents cannot be changed to add a touch of customisation. What's clear from taking a look at the back is that the cooler is too large for the PCB. This is why we see a plastic securing plate - it has no other job - on the left next a board that actually measures 188mm long. It is also the reason why the heatsink is punctuated by the 8-pin power connector that, on first glance, looks oddly out of place. Stripping the cooler back reveals a few truths. 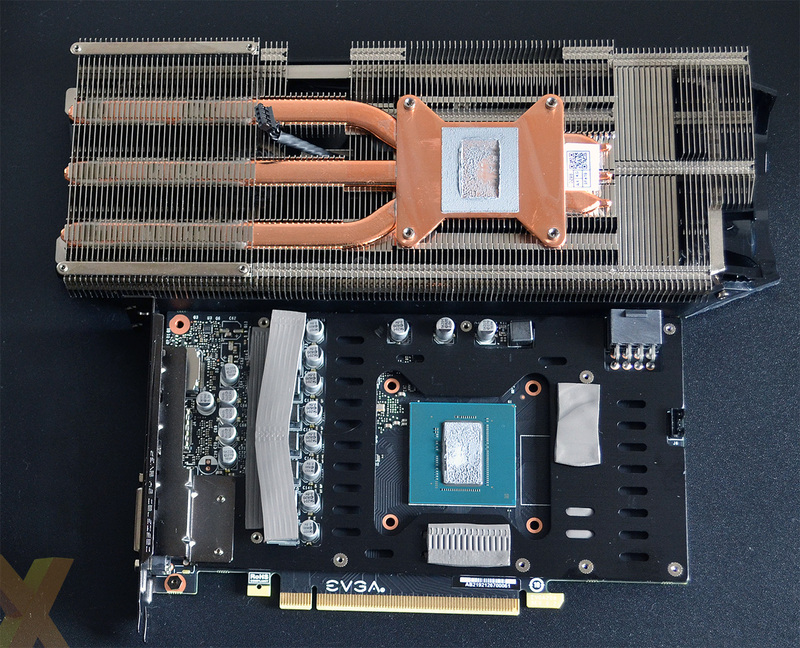 A central copper block makes excellent contact with the core, is attached to three flattened heatpipes running three-quarters the length of the heatsink, and EVGA uses an intermediate metal plate to cool the memory chips, as well as having thick thermal tape for the VRMs. We'd characterise the cooling and contact as above average. The sum of these cooling efforts, plus the 1,860MHz boost speed - the 6GB of GDDR6 memory is left untouched, operating at 12Gbps - pushes the card's pricing up from a bone-stock £260 to around £300, putting it perilously close to the next GPU up, the GeForce RTX 2060. Outputs are more conventional, mind, with DisplayPort, HDMI and VGA making up a sensible trio. 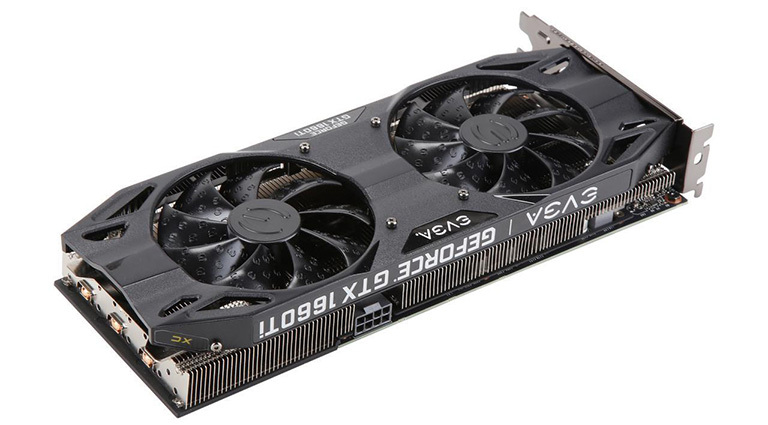 EVGA backs the card with a standard three-year warranty. At the time of writing, Nvidia is not offering any free games to sweeten the bundle but EVGA has taken it upon itself to bundle GRIP: Combat Racing - a well-reviewed game released late last year. Good on EVGA for doing so.